A Brief Explanation, AKA What the heck was I thinking? A few years ago, my friends and I developed an interest in costuming; primarily costumes appropriate to wear to our local Renaissance Festival. While discussing noble or court gowns, my best friend (Laura Ulak) and I found ourselves standing in the printed cotton aisle at a discount fabric store. I might be paraphrasing, but that is essentially the scope of the conversation. At that point, Laura and I, along with most of our costuming friends, decided we needed Twisted Historical costumes. But where would we wear them? Fortunately, Kirk Johnson of the Bristol Renaissance Faire told us about their Day of Wrong. Laura and I immediately planned a trip to the Faire for the summer of ’09. And I started work on my costume. It debuted in August of 2009 to mostly positive reviews, except for a few bitter Bears fans. 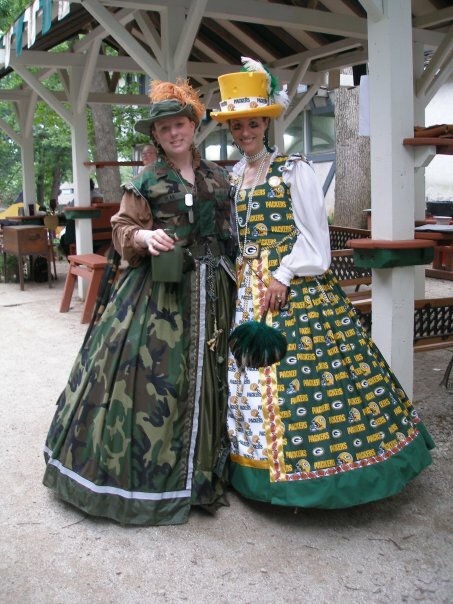 I would like to dedicate this costume to my Grandma Schneider, a diehard Packer Backer, and Laura Ulak’s Grandma Grace, who taught her how to sew. The late 15th century, during the reign of Queen Elizabeth the First. Country of origin is England, social class is Noble. In short, this is an Elizabethan court dress made from modern, licensed sports team logo materials. I used 100% cotton, a natural fabric, for the construction of the garment, however, the pattern is not period appropriate. I used plastic cable ties in the corset instead of metal. I used hoop steel instead of reeds in the farthingale. Accessories are completely made of artificial materials. And the outcome? I won Most Humorous Presentation. Adding to the honor and GLORY of the Minnesota Society of Costumers.